It has thick spikes and a flower that opens into a star like shape. The edges of the stalks have round bumps on the edges. 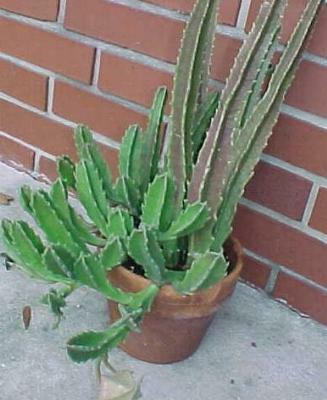 What you have is one of the Stapelia tribe. These have the most amazing flowers, which have the added benefit (or not) of smelling like rotting meat. This peculiar attribute is for attracting flies to pollinate it. If you don't happen to like the smell of carrion, and most people don't, then you can put the plant outside for the flowering period. See this page for more about Huernia, another close relative also called Carrion Flower.